RenewEd: What can we learn from video games? Recently I spent some time playing Guitar Hero on Playstation... and I've been thinking about my experience. You know how it works: fire up the game, and one of your first tasks is to select the difficulty level: Easy, Medium, Hard, or Expert. Having never played the game previously, I foolishly selected "Expert" mode - surely a kid's game like this would be easy for me? However, one minute of absolute frustration at this level and it was time to start again - this time in "Easy" mode. All went well at first, but after ten minutes I was getting bored. It wasn't challenging enough, and I wasn't having much fun. Eventually I settled into "Medium" mode, and an hour or two later I was still enjoying myself - I was clearly in a state of flow. 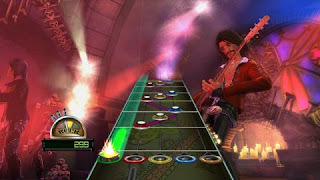 What can we learn from Guitar Hero, and other video games? As Vygotsky suggests, we should aim for an appropriate level of difficulty in our teaching and learning activities, ensuring that learning outcomes are reasonably achievable without being boring, but enjoyably challenging without being frustrating. This approach should apply across all aspects of our course design: content, assessment, workload and time commitment should all be built around the learning needs of our students... and we shouldn't be afraid to challenge them! I played Guitar Hero for the first time the other night. I was over at a friends house and I didn't like it because they were all so much better than me. I think another factor for flow is the environment or context, the pressure of being around people who ruled at the game did not let me get into a state of flow, i just felt like an idiot! @Jules: Hmmm... interesting how the presence of others affects performance and effort. Certainly some lessons there, too! @Jo: Thanks once again - looks like you enjoyed the conference. I'll check out Derek's blog.